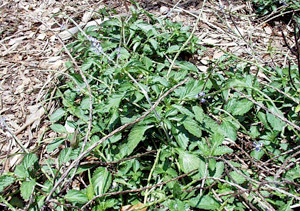 General Landscape Uses: Groundcover in open, dry areas. Also wildflower gardens. Availability: Widely cultivated. Available at All Native Garden Center and Plant Nursery in Fort Myers. 239-939-9663. Dimensions: About 1-3 feet in height. Generally broader than tall. Range: Its native range in South Florida obscured, but probably native to the Monroe, Dade, Collier and Lee counties, mostly along the coast; West Indies, Mexico and Central America. 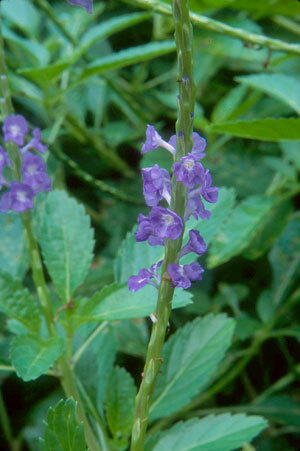 Widely cultivated and naturalized outside of its historic range. Habitats: Coastal rock barrens and open disturbed sites. Soils: Moist, well-drained sandy or limestone soils, without humus. 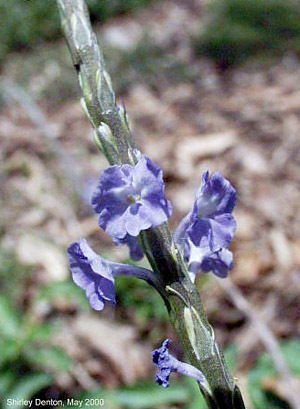 Flower Color: Blue or purple with a white center. 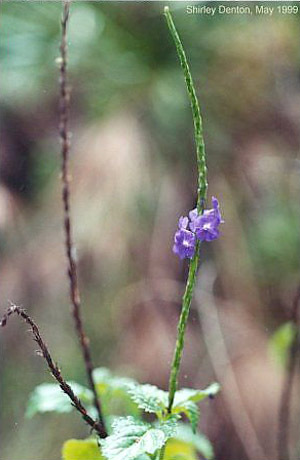 Flower Characteristics: Small, semi-showy flowers on long spikes. Fruit: Two inconspicuous tuberculate nutlets. Wildlife and Ecology: Larval host plant for tropical buckeye (Junonia genoveva) butterflies. Nectar plant for many butterflies including: Bahamian swallowtail (Papilio andraemon), clouded skipper (Lerema accius), Cuban crescent (Phyciodes frisia), Dorantes longtail (Urbanus dorantes), fiery skipper (Hylephila phyleus), great southern white (Ascia monuste), gulf fritillary (Agraulis vanillae), julia (Dryas iulia), large orange sulphur (Phoebis agarithe), little yellow (Eurema lisa), long-tailed skipper (Urbanus proteus), lyside skipper (Kricogonia lyside), Meske's skipper (Hesperia meskei), Palatka skipper (Euphyes pilatka), red admiral (Vanessa atalanta), Schaus' swallowtail (Papilio aristodemus ponceanus), swarthy skipper (Nastra lherminier), tropical checkered-skipper (Pyrgus oileus) and variegated fritillary (Euptoieta claudia). 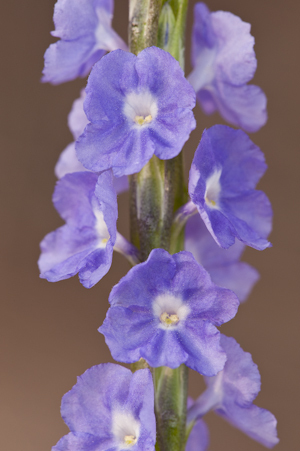 Comments: Widely cultivated outside of its native range, and perhaps escaping from cultivation in Central Florida and Alabama.